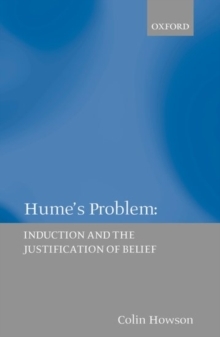 Colin Howson offers a solution to one of the central, unsolved problems of Western philosophy, the problem of induction. In the mid-eighteenth century David Hume argued that successful prediction tells us nothing about the truth of the predicting theory. No matter how many experimental tests a hypothesis passes, nothing can be legitimately inferred about its truth or probable truth. But physical theory routinely predicts the values of observable magnitudes to many small places of decimals and within very small ranges of error. The chance of this sort of predictive success without a true theory seems so remote that the possibility should be dismissed. This suggests that Hume's argument must be wrong; but there is still no consensus on where exactly this flaw lies. Howson argues that there is no flaw, and examines the implications of this disturbing conclusion for relationbetween science and its empirical base.